Anthony Martial's rich goalscoring form continued as Manchester United eased into the League Cup fourth round with victory at home to Ipswich Town. Wayne Rooney got his first domestic goal of the season to put United ahead against their Championship opponents, who made 11 changes for the game. Midfielder Andreas Pereira, 19, scored a spectacular free-kick to double the lead on his first start. 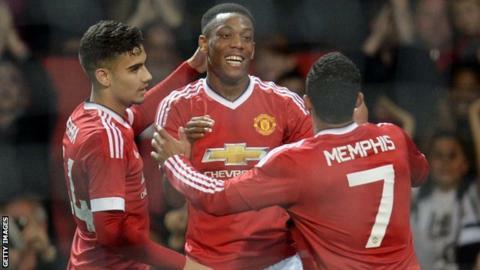 And substitute Martial, also 19, coolly slotted home a third in injury time. It was the striker's fourth goal in as many matches since his £36m move from Monaco. Fellow substitute Memphis Depay controlled the ball into his path before the Frenchman stroked beyond Bartosz Bialkowski in the Ipswich goal. But the goal of the night belonged to Pereira, whose dipping free-kick bent over the Ipswich wall and into the corner. United face Middlesbrough, who beat fellow Championship side Wolves 3-0 on Tuesday, at home in the next round. "It is not so difficult for Martial to stay grounded because he is a player who is very modest and he knows he can score because of his fellow players. "Twice we made it very easy for him because the gaps were existing and then with his speed and his composure he can score. "He did it also against Liverpool and now again. We are happy but still we have to keep our feet on the ground." "Manchester United deserved to win. But I am delighted with my players. "I could have put any team out against that team and probably still would have been beaten." Match ends, Manchester United 3, Ipswich Town 0. Second Half ends, Manchester United 3, Ipswich Town 0. Goal! Manchester United 3, Ipswich Town 0. Anthony Martial (Manchester United) right footed shot from the centre of the box to the bottom right corner. Assisted by Memphis Depay. Attempt saved. Andreas Pereira (Manchester United) right footed shot from the centre of the box is saved in the bottom left corner. Corner, Manchester United. Conceded by Piotr Malarczyk. Corner, Ipswich Town. Conceded by Phil Jones. Piotr Malarczyk (Ipswich Town) wins a free kick in the defensive half. Substitution, Ipswich Town. Larsen Touré replaces Jay Tabb. Corner, Manchester United. Conceded by Josh Yorwerth. Attempt missed. Anthony Martial (Manchester United) right footed shot from the centre of the box is close, but misses to the left. Substitution, Manchester United. Anthony Martial replaces Juan Mata. Joshua Emmanuel (Ipswich Town) wins a free kick on the right wing. Corner, Manchester United. Conceded by Bartosz Bialkowski. Attempt saved. Juan Mata (Manchester United) left footed shot from outside the box is saved in the top centre of the goal. Substitution, Ipswich Town. Freddie Sears replaces David McGoldrick. Substitution, Ipswich Town. Brett Pitman replaces Daryl Murphy. Goal! Manchester United 2, Ipswich Town 0. Andreas Pereira (Manchester United) from a free kick with a right footed shot to the bottom right corner. Attempt saved. Antonio Valencia (Manchester United) right footed shot from outside the box is saved in the bottom right corner. Attempt missed. Tommy Oar (Ipswich Town) left footed shot from outside the box is too high. Attempt blocked. Jonathan Parr (Ipswich Town) left footed shot from outside the box is blocked.